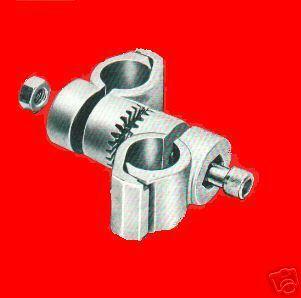 Rotocon Snap-On Assembly Clamps, Aluminum and Zinc Alloys, Large Series for 1/2 inch to 1 inch OD tubes, rods or pipes, all interchangeable. For instance, you can clamp a 1" OD rod to a 1/2" OD rod or any other size in this series. Rod, tube or pipe direction can be adjusted to any 15 degree angle increment. Set includes 2 clamps (4 pieces) plus 1 nut and bolt. $15.00 per set plus shipping. Approx Shipping Wt 13 oz. for aluminum and 24 oz. for zinc. Incremental weight 10 oz.for aluminum and 20.8 oz for zinc. FL Application Example--Works with any of the above 1/2 to 1 inch (Large) SRTL series. 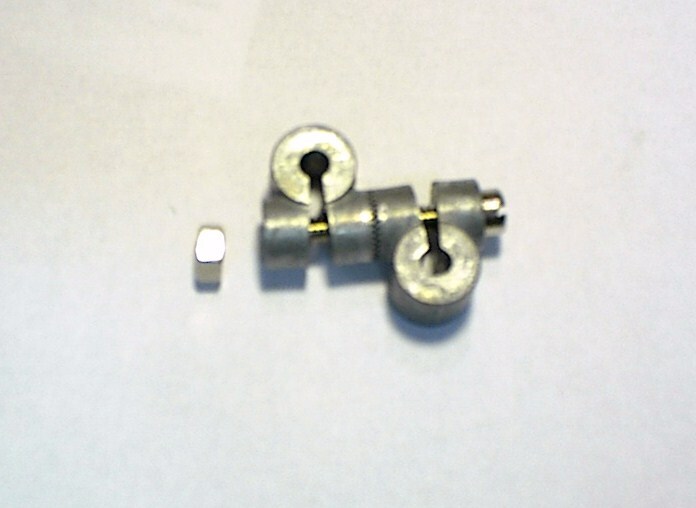 This set fits with other Large Series clamps and allows connections in the same plane. Rod or pipe direction can be adjusted to any 15 degree angle increment. 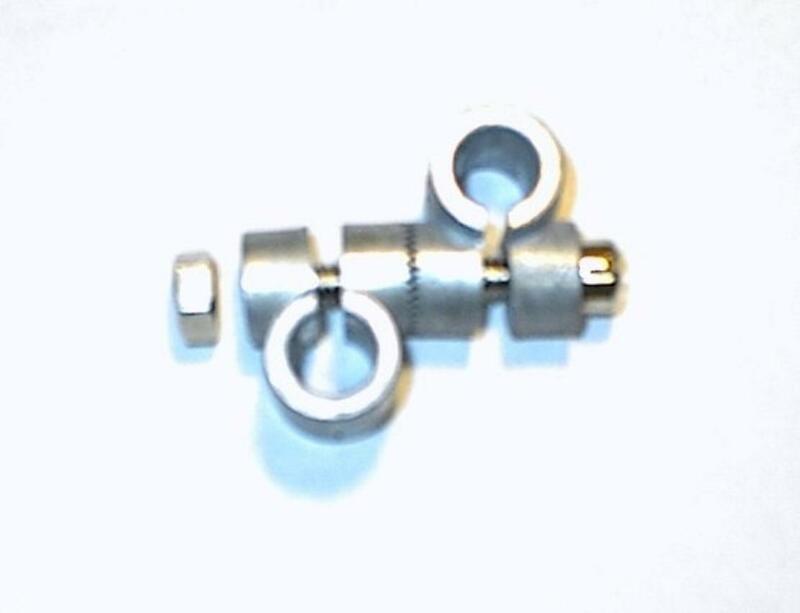 Set includes two links with one nut and bolt. $12.50 per set plus shipping. Approx Shipping Wt 13 oz. Additional, if needed, can be purchased here. 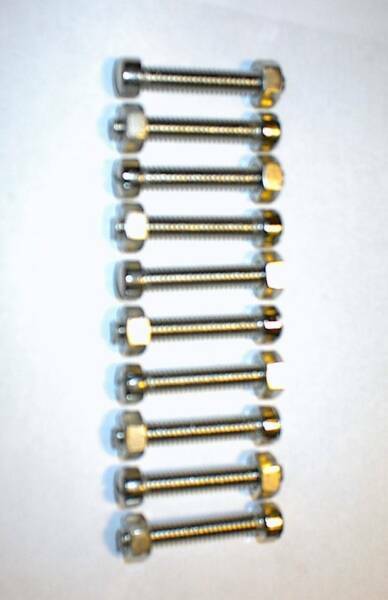 3/8--16 x 2 3/4" socket head cap screw and 3/8--16 hex nuts, all in nickel plated steel. Shipping additional. Approx Shipping Wt 20 oz. Approx Shipping Wt 17 oz. Approx Shipping Wt 5 oz. Rotocon Large Series, Die-Cast Aluminum or Zinc, 1/2 to 1"
Rotocon SRT-1/2 Snap-On Zinc Alloy Assembly Clamps. Fits on 1/2 inch O.D. rods, tubes or pipes and are designed for 10 degree increments of adjustment. Set includes 2 clamps (4 pieces) with a nickel plated steel 1/4--20 x 1 1/2 " slotted filister head screw and a 1/4--20 hex nut. Approx Shipping Wt 5 oz. Rotocon RT-1/4 Slip-On Zinc Alloy Assembly Clamps. Fits on 1/4 inch O.D. rods, tubes or pipes. Designed for 10 degree increments of adjustment. Set includes 2 clamps (2 pieces) with a nickel plated steel 1/4--20 x 1 1/2" slotted filister head screw and a 1/4--20 hex nut. Approx Shipping Wt 6 oz. Rotocon RT-3/8 Slip-On Zinc Alloy Assembly Clamps. Fits on 3/8 inch O.D. rods, tubes or pipes. Designed for 10 degree increments of adjustment. Set includes 2 clamps (2 pieces) with a nickel plated steel 1/4--20 x 1 1/2" slotted filister head screw and a 1/4--20 hex nut. Approx Shipping Wt 6 oz. Rotocon RT-7/16 Slip-On Zinc Alloy Assembly Clamps. Fits on 7/16 inch O.D. rods, tubes or pipes. Designed for 10 degree increments of adjustment. Set includes 2 clamps (2 pieces) with a nickel plated steel 1/4--20 x 1 1/2" slotted filister head screw and a 1/4--20 hex nut. Approx Shipping Wt 5 oz. Rotocon RT-1/2 Slip-On Zinc Alloy Assembly Clamps. Fits on 1/2 inch O.D. rods, tubes or pipes. Designed for 10 degree increments of adjustment. Set includes 2 clamps (2 pieces) with a nickel plated steel 1/4--20 x 1 1/2" slotted filister head screw and a 1/4--20 hex nut. Approx Shipping Wt 5 oz. 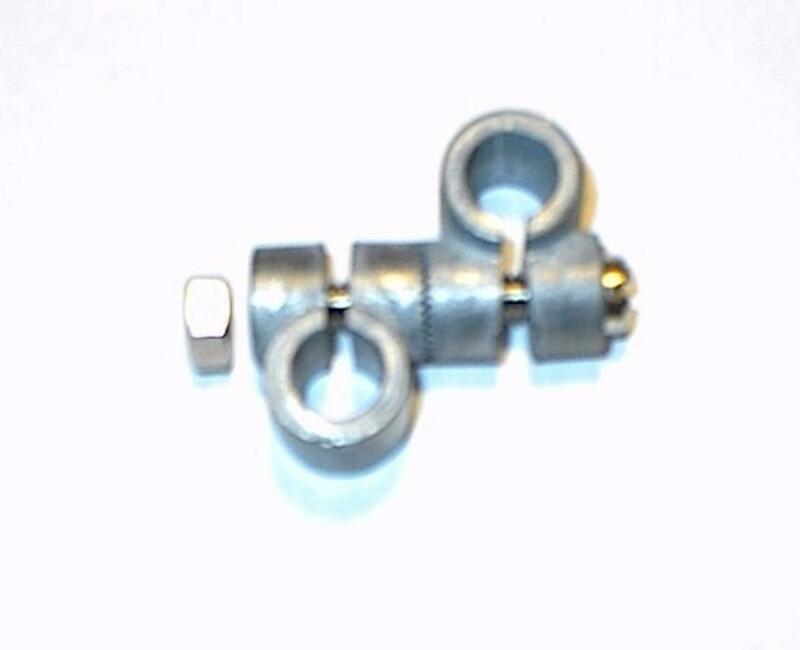 Rotocon P-1/8 Slip-On Zinc Alloy Assembly Clamps. Fits on 1/8 inch I.D. NPS pipes. Designed for 10 degree increments of adjustment. Set includes 2 clamps (2 pieces) with a nickel plated steel 1/4--20 x 1 1/2" slotted filister head screw and a 1/4--20 hex nut. Approx Shipping Wt 6 oz. Rotocon P-1/4 Slip-On Zinc Alloy Assembly Clamps. Fits on 1/4 inch I.D. NPS pipes. Designed for 10 degree increments of adjustment. Set includes 2 clamps (2 pieces) with a nickel plated steel 1/4--20 x 1 1/2" slotted filister head screw and a 1/4--20 hex nut. Approx Shipping Wt 5 oz. Rotocon Small Series Nut and Bolt, Steel. Fits all clamps in the "Small" zinc alloy series. Nickel plated steel 1/4--20 x 1 1/2" slotted filister head screw and a 1/4--20 hex nut. 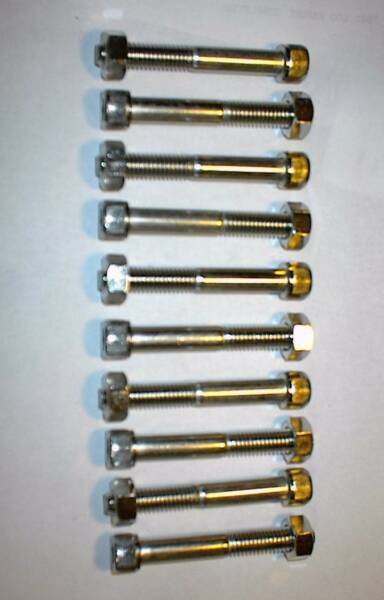 Pkg includes 10 bolts and 10 nuts. Approx Shipping Wt 7 oz. 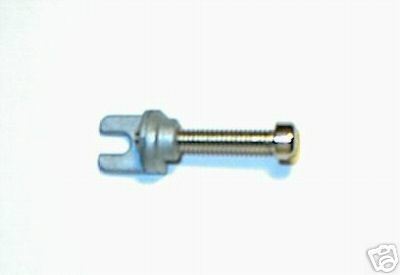 Rotocon Angle Nut With Bolt Set. Nut is made of zinc alloy and bolt is nickel plated steel 1/4-20 x 1 1/2". Angle nut is usually attached to Rotocon clamps at the base of the structure for additional support. Each set consists of 1 angle nut and 1 bolt. Approx Shipping Wt 3 oz. Application example showing the anchoring position of an angle nut with the RT-1/2 , also attached to the M-90 mounting base. Rotocon CL-1/4 Coplanar Link, Zinc Alloy. Used primarily to attach and align structures into the same plane. Structure can be attached at angles at 10 degree increments due to the 36-toothed faces of the small series clamps. Set consists of 2 links and 1 nickel plated steel 1/4--20 x 1 1/2" slotted filister head screw and 1 hex nut (1/4--20). Approx Shipping Wt 6 oz. Rotocon M-90 Mounting Base Set. Used to anchor or mount structures in conjunction with other clamps in the "Small Series" attached to rods, pipes or tubes. Forms rigid joints at 10 degree increments. Mounting bases are provided with 2 threaded holes for No. 10 screws and two 7/32" non-threaded holes on each angle face to facilitate anchoring. Set consists of 2 bases and 1 nut and bolt. Approx Shipping Wt 8 oz. Rotocon Small Series, Non-Metallic Lexan, 1/2 Inch. Polycarbonate Lexan is electrically non-conductive, will not distort at temperatures below 275 degrees F and has a self extinguishing rating for flamability. Toothed faces of paired units mesh to form rigid joints at any 10 degree increment. Nuts and bolts are also made of Lexan. Rotocon LSRT-1/2, Lexan Set. 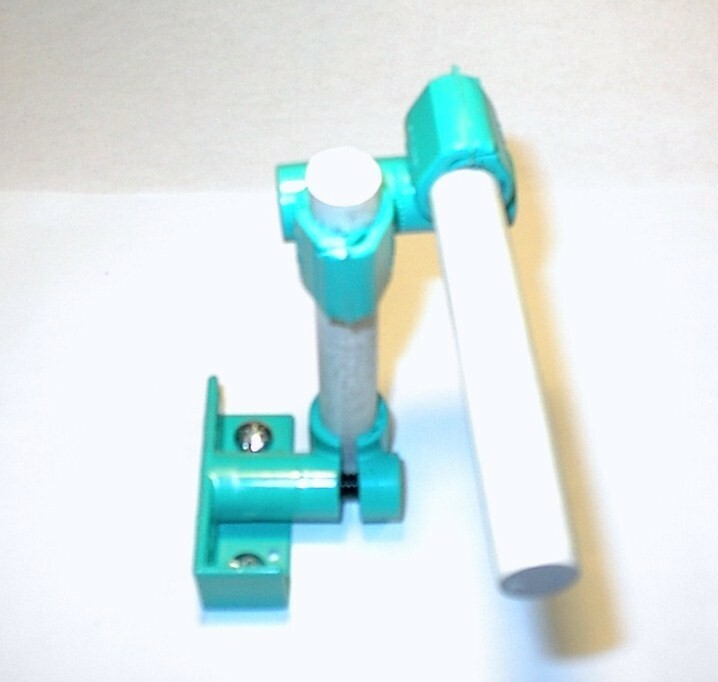 These clamps feature the "Snap-On" design which allows attachment to 1/2 inch rods or tubes already in place without disassembly of the structure. They can be assembled/disassembled easily with a flat blade screwdriver or even a coin. Each set consists of two clamps (4 pieces) plus a nut and bolt. Approx Shipping Wt 2 oz. Rotocon LM-90 Mounting Base, Lexan Set. The Mounting Base is used to anchor an assembly or structure to its base using the LSRT-1/2 above. There are two 5/32" and two 7/32" non-threaded holes on each of the two angle faces for anchor screws. 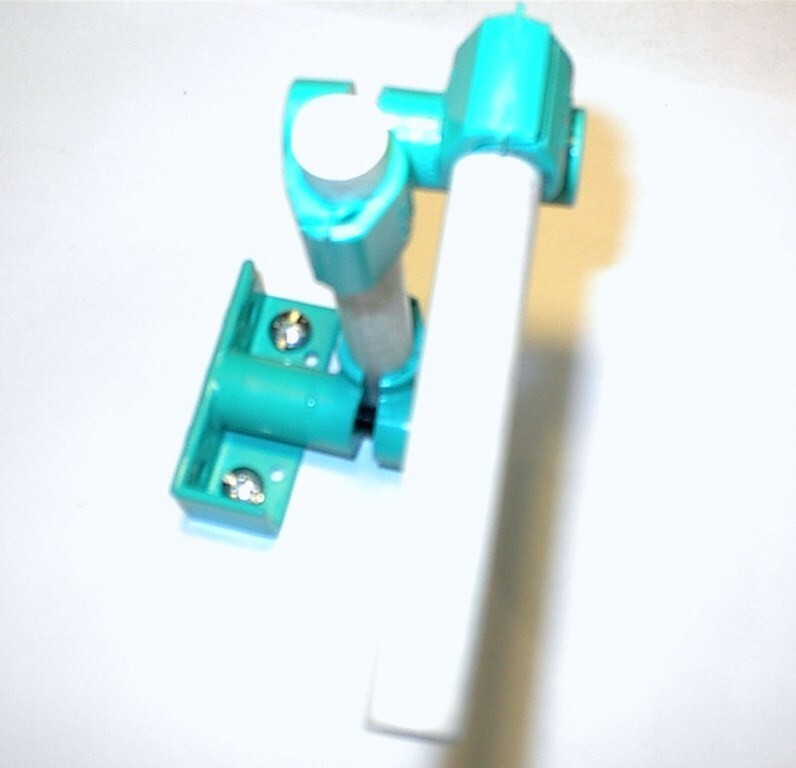 Each set consists of two mounting bases with one nut and bolt, all Lexan. Approx Shipping Wt 3 oz. Base Flange, Aluminum, Large Series. 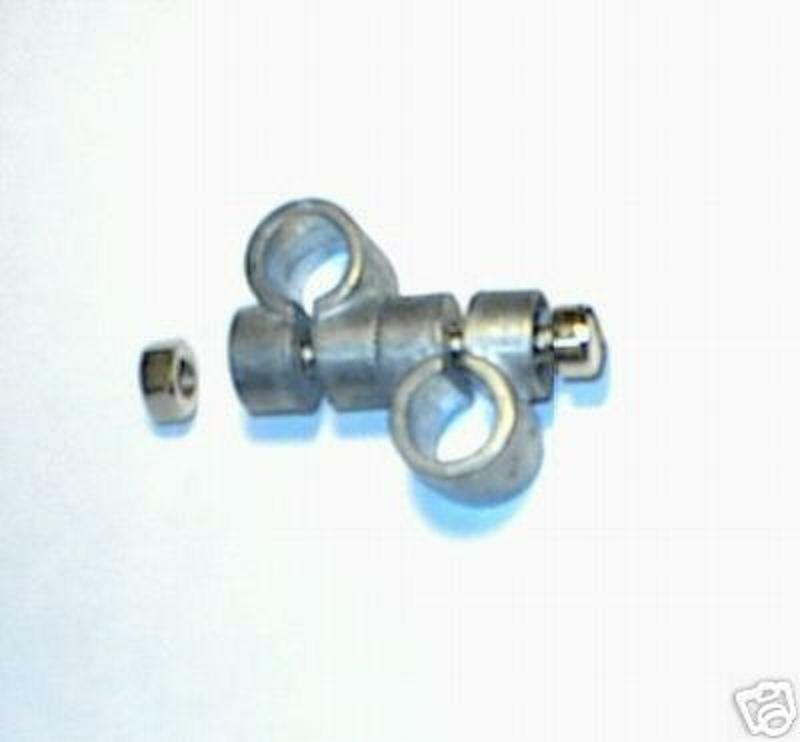 This set fits with other Rotocon Large Series clamps and is used to anchor the assembly to the base. Set includes two bases (each with two parts) plus one nut and bolt. $15.00 per set plus shipping. Approx Shipping Wt 18 oz. 5/16" SAE Short Arm Hex Key or Allen Wrench, Steel. Short arm approximately 1 1/4", Longer arm 3 3/4", gun metal black finish. This size fits the socket head cap screws used in the Rotocon Large Series. Approx Shipping Wt 4 oz. 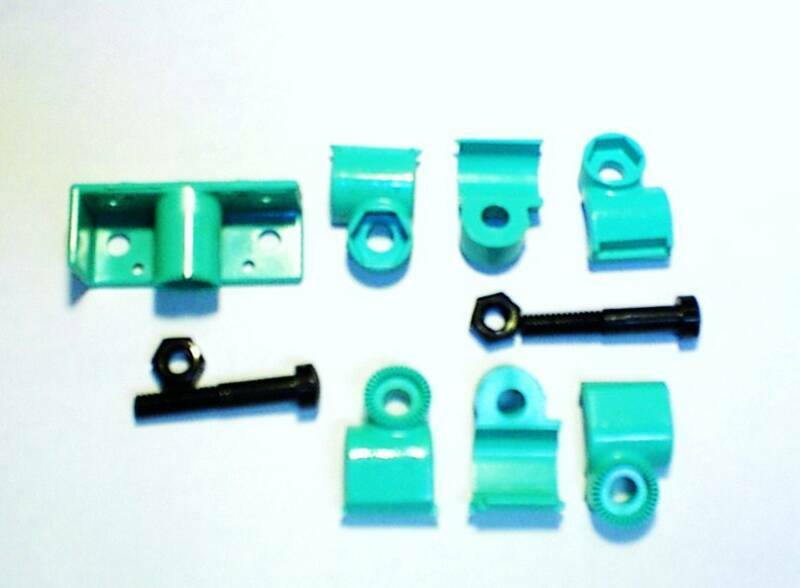 The fittings, as well as the nuts and bolts, in this pack are made of LEXAN, a polycarbonate resin developed by General Electric. Heat distortion of LEXAN occurs at temperatures above 275 degrees F. The snap-on design allows attachment to a rod or tube anywhere along the length without disassembly of the structure. Each joint is designed for 10-degree increments of adjustment. Lightweight, yet strong; Grips tightly, will not slip, yet is easily adjusted. Package contents as shown, 1/2 set LM-90 (Mounting Base Angle), 1 & 1/2 sets of LSRT-1/2 (snap-on clamps for 1/2 inch rods or tubes) and two F-3.75 (1/2" round fiberglass rods 3 & 3/4" length). Anchoring screws are not included. Approx Shipping Wt 7 oz. Same item, slightly different view. This demonstrates the concept--you determine the application! 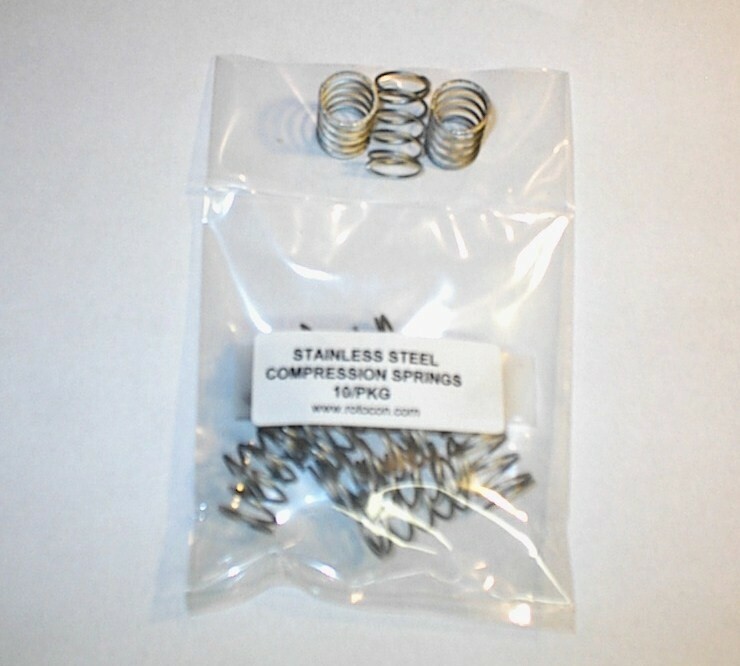 Stainless Steel Compression Spring Insert. 0.045 " SS Wire, 6 coils 0.625 OD 1 inch length. Facilitates frequent changes of angle. Approx Shipping Wt 3 oz. Shipping for on-line orders will be invoiced to your PayPal account in an email to you, after the order has been placed and we have packed, weighed and determined the correct cost for shipment. Or, if you have a UPS or FedEx account, we can ship on it and there will be no further payment to Rotocon. See "Contact Us" for explanation of shipping options and charges. Please note that when you click on an item to buy it, your PayPal cart will sometimes open as a small window and you can not see everything in that window. In order to see all the items you must maximize that window. Then you will be able to see the quantity, change it and update or remove an item before proceeding to checkout. Fits 1" OD rods, now in die-cast zinc alloy only--former item code SRT-1. For 1 to 4 sets the price includes free U.S. Priority Mail shipping. send an invoice for shipping by email after we determine the correct shipping cost. Fits 7/8" OD rods, now in die-cast aluminum only--former item code SRT-7/8. For 1 to 4 sets the price includes free U.S. Priority Mail shipping. Fits 3/4" OD rods, now in die-cast zinc alloy only--former item code SRT-3/4. For 1 to 4 sets the price includes free U.S. Priority Mail shipping. More than 4 sets needed, click this button. $15.00/set plus shipping. 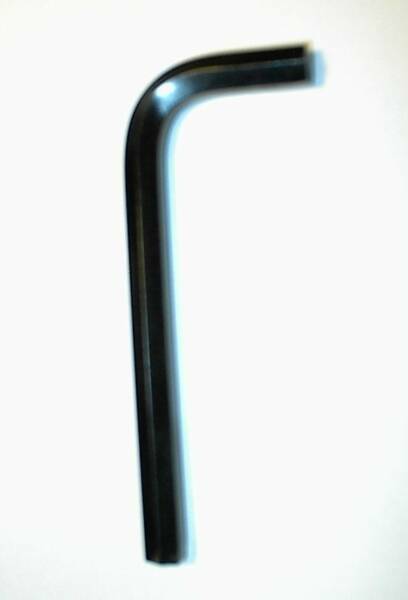 Fits 5/8" OD rods, now in die-cast aluminum--former item code SRT-5/8. For 1 to 4 sets the price includes free U.S. Priority Mail shipping. free U.S. Priority Mail shipping.